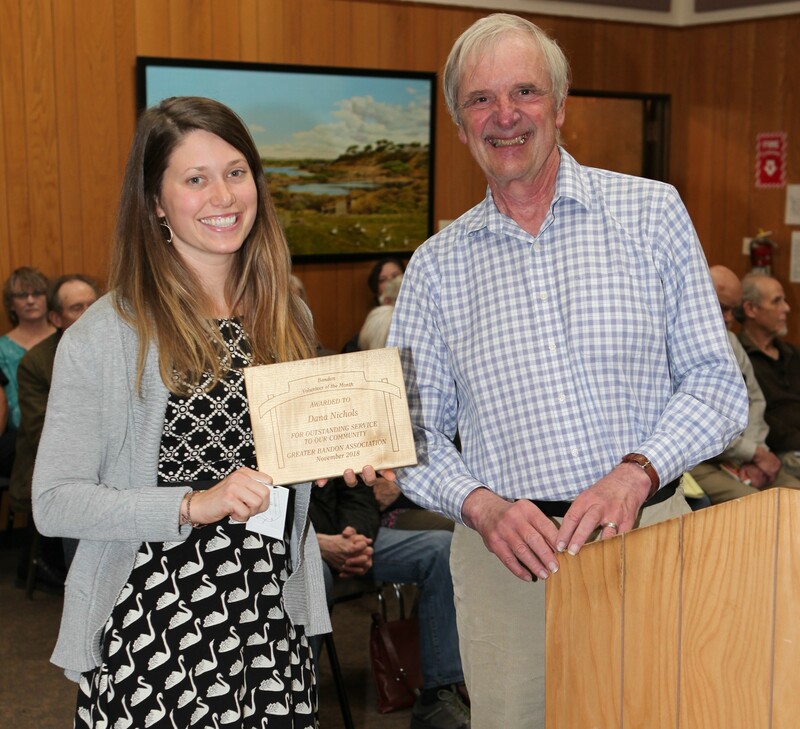 Dana Nichols was recognized by the Greater Bandon Association as Bandon’s Volunteer of the Month at the November 5th meeting of Bandon’s City Council. GBA has entered its fourth year of presenting this award to the many outstanding individuals that contribute to making Bandon a better community to live in. Dana was presented the award in form of a plaque and a gift certificate from Bandon Brewing Company. Dana has tirelessly served the entire community of Bandon, helping with Cranberry Festival, Gorse Blossom Festival, Alive After Five, Music in the Park, Night of 10,000 Lights, the lighted street parade, and more. She has served on citizen committees for Economic Development, Design, and Promotions through GBA. Dana also was instrumental in getting the funds for parklets for Old Town Bandon. Most recently, she was elected President for the Greater Bandon Association’s Board of Directors. The Greater Bandon Association will be honoring one of Bandon’s many volunteers that are making a difference in the community each month. Nominations for the May award should be e-mailed to harv@greaterbandon.org or mailed to P.O. Box 161 by close of business on November 23rd.